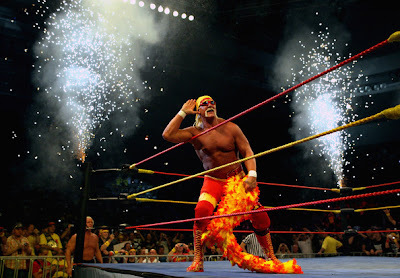 I'm an 80's baby and this week's Thick Neck Thursday post is dedicated to the original Thick Neck, Hulk Hogan!!! It's hard to believe Hogan is 59 y.o., but he made his wrestling debut in the late 70s... going on to have a career that spanned over 30 years! It's crazy impressive that he's still relevant, let alone how great of shape he's been able to keep his body in. Hogan is a daunting 6'7" 302lbs of old school Thick Neck... still working the crowd with his big persona and red and yellow signature colors. Just hearing his theme music puts a smile across my face... everything Hogan screams nostalgia for me. My brother was completely obsessed with wrestling and I ended up watching countless hours of WWF (WWE, WCW, etc... whatever the hell else they changed their name to) as a result of him. Hogan was always one of my favorites and I'd probably still go hard for him today lol. Any fellow 80's babies out there spend their childhood completely enthralled in all things wrestling?